Editor’s note: I wrote this 8 years ago and while some ideas I hold today are more developed, I don’t think I’d change today what I wrote then. This essay is drawn from a talk given to the leadership of Orthodox Christian Laity on March 9, 2009, in Pinellas Park, Fl. We know Solzhenitsyn’s story. In WWII Solzhenitsyn was a Soviet Army officer who was arrested and sentenced to eight years in the Gulags under Stalin. In prison Christ captures him. The encounter changes him, so much so that he clandestinely wrote the three volume “Gulag Archipelago” that laid bare the moral bankruptcy of Marxism. His work caused the collapse of the Marxist intellectual establishment in Western Europe and tilled the cultural ground that led to the eventual collapse of the Soviet Union. “One word of truth outweighs the whole world” is a proverb that draws deep from the well of Christian anthropology and cosmology. 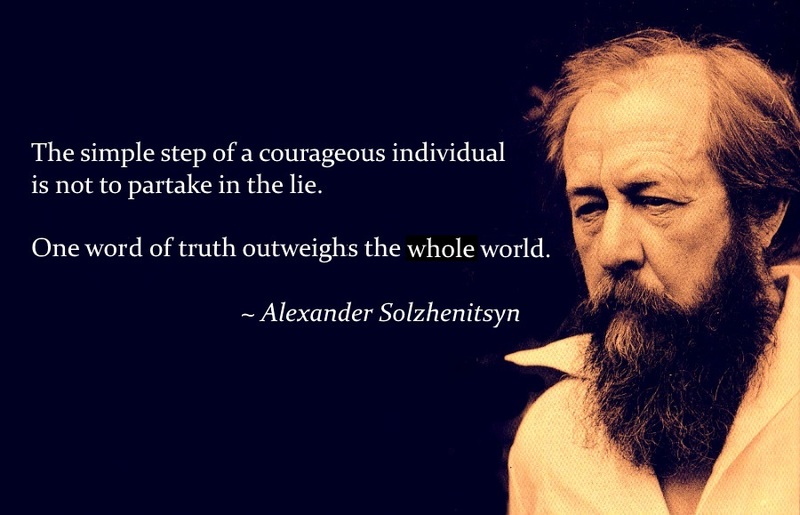 Solzhenitsyn, like the simple peasants from whom he drew this wisdom, grasped that the most powerful agent of change in the world is a word spoken in truth. We see it in Holy Scripture. In the opening pages of Genesis we read that God created the world by speaking it into existence. Unlike the polytheistic religions where the world is created out of the stuff and the substance of the gods (thus barring any ontological distinction between Creator and created), or the eastern religions where the material creation is merely differentiated and impersonal energy, the God of Abraham stands outside of space and time because he creates through speech, through the spoken word. Creation comes from God but is not of God. Language is key here. God said “Let there be light” and out of nothing light appeared. He separated the land from the sea, created the sun and the stars, and all the other events of the creation by the same spoken word. Only man is created differently. Man becomes a living soul when God breathed into the dust of the ground that was already spoken into existence. Later, after the world that God spoke into existence fell through the disobedience of Adam, God begins the work of restoring His creation anew. Again God speaks, first through the word of the prophet, then through the word of the apostle. The first spoke of the coming of the Christ, the second reveals Him through the preaching of the Gospel. When the Gospel is preached, Christ is revealed. Christ is Savior, and our introduction to Christ — the means by which we awaken to His existence and become aware of His benevolent love towards us — occurs when we hear the Gospel. And the Gospel, in order to be heard, must first be preached. The Gospel is not a series of propositions, but the doorway into concrete, existential encounter with the Risen Christ. We can say then that God first enters the world through a word. Further, when a word is spoken in truth, it draws from and references Him who is Truth — Jesus Christ. Christ said, “I am the Way, the Truth, and the Life.” The Apostle Paul wrote that, “All things were created through Him and for Him…He is before all things, and in Him all things consist” (Col. 1:17). Any word of truth references the Truth, even if the words make no direct mention of Christ. A word spoken truth is never morally neutral. And a word spoken in truth contains its own verification because its final referent is Him who is the Truth. It commends itself to the conscience of those who have ears to hear, which is to say an inner orientation — the tilled soil of the heart that receives the word with gladness. Further, the creative potency of a word spoken in truth elicits the warning to count the cost of speaking it. The man with a darkened heart will spit out the word of truth because of indifference, surfeit, preoccupation with mundane things and other reasons, and may persecute the speaker. Thus, sobriety and courage are necessary virtues in following Christ’s command that his followers bring truth into the world. Solzhenitsyn understood this. He wrote knowing that he would be killed if his writings were ever discovered. When the word of truth is heard however, it redeems and restores the hearer. It can foster freedom and unleash deep creativity. The old can become new. Corruption can become wholesomeness. Sinners can become saints. It changes individuals. And as individuals change, their relationships change. As relationships change, culture changes. As cultures change, institutions change along with it. One word of truth outweighs the whole world. I’m writing from Ireland and just want to say, I enjoyed the article Father, keep up the good work! Oops! Sure does. I need either new glasses or a new brain. In any case, fixed it. I did, in the person of Jesus Christ. He led me to the Orthodox Church. Pointing out lies is not enough. Jesus Christ is who He says He is. His Incarnation, mission, Death on the Cross, Ressurection and Ascension are all real events because He is real. No other philosophy, religion or ideology has the same level of reality and most are lies or damned lies. Solzhenitsyn also warned us against ideologies. They are idols. Whether Communist, Fascist, Democratic, Capitalist, Theocratic or Religious. They turn the germ of truth into a lie which is what gives them their destructive power. 2 Tim 3:5 warns us too. God provides. Everything works for our salvation. I’m always struck by the poetry and intellectual weight of Scripture (even if I find some of its ethics confusing or even abhorrent). Nothing is written or even conceived like this today. Illiterate savages? Compare Genesis or the Pauline Epistles to the pap found on the radio or even Christian bookshelves today. One Word of Truth, outweighs the whole World. I am the Way, the Truth, and the Life, says the Lord. One weight of Truth, outweighs the whole World. different things, the imagery appeals to me also.